In Tokyo raging ghouls, cannibal monsters hidden among humans to better feed. It's up to you to discover the true nature of the other players to win the victory! In this game of deduction, each player has a hidden role: simple human, ghoul, or detective from the Ghoul Control Center. Keep your goals secret as everyone conducts the investigation in different parts of Tokyo. A fast and dynamic game, even at 8 players, the eliminations are at the end of the game: no player is excluded during the game phase. 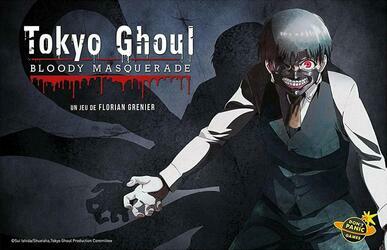 Tokyo Ghoul has two variants, and three game modes. The tension of the objectives to achieve perfectly combines with the modern horror atmosphere of the series. A manga license that cardboard: The work of Sui Ishida has sold more than 7 million copies.